Can't login - "Error: coercing to Unicode: need string or buffer, NoneType found"
but when I try to login, after I give access to InSync via google drive, I get the error “Error: coercing to Unicode: need string or buffer, NoneType found”. Will be tagging our engineer @jimperio and he will get back to you. 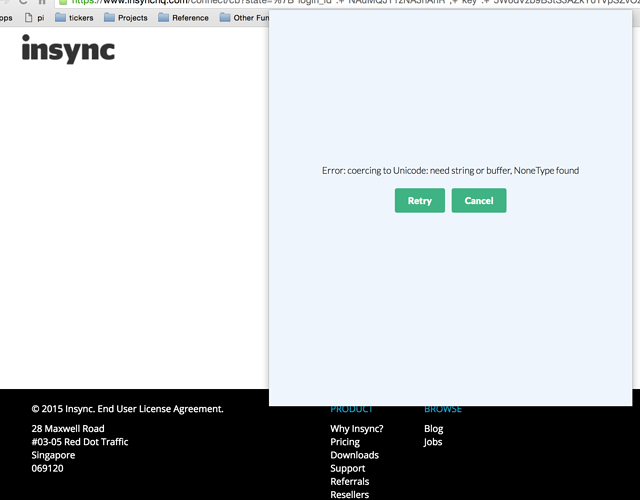 @neilthomson Could you send your Insync logs to support@insynchq.com? Thank you. A coworker of mine is seeing this same issue. Was a fix posted? I’m getting this too. Mac OS X 10.11.4. Same issue. Are we any closer to a resolution? I can’t use the product at all. Same issue on OS X 10.11.4. I’cant add a new Google Account to Insync. I’ve purchase a new licence right now and i’cant use it. Please fix that. Same error here. On OS X El Capitan 10.11.4. The same error, I’ve tried 1) alternative login 2) safari as default browser 3) both and the behaviour is the same in all cases. Insync version is 1.3.6. Also having the same issue here, is there a fix?